Governments: Listen to your people! Abandon Doha—Confront the Crises! 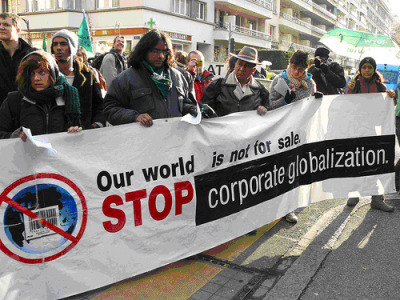 The 7th Ministerial Meeting of the World Trade Organisation (WTO) was held in Geneva in the midst of multiple crises, when people all over the world are demanding that governments take decisive action to protect their livelihoods from the dangers of corporate led globalisation. The failure of deregulation and liberalisation that the WTO locks in through its trade regime are all too evident to the ordinary people in the world. That this Ministerial was a non-negotiating meeting, is a reflection of the massive resistance to the WTO trade regime from workers, farmers, fishers and social movements from across the world. Trade ministers did not come to Geneva empowered with a popular mandate to move forward the negotiations. But in an inexplicable but expected disconnect to the realities back home, many of them have called for a speedy conclusion to the Doha Round in 2010. Fifteen years after its inception, the WTO is further away than ever from an equitable, just, rules-based multilateral trading system that can foster development. Since its launch eight years ago, it has become progressively more evident that the Doha Development Round is completely antagonistic to the real priorities of peoples in developing countries. Instead, the demands of the global powers continue to set the agenda for trade negotiations and are doing so in a climate of fear where the ‘blame game’ has become the order of the day. Any country that is not prepared to support the speedy conclusion of the Doha Round is in danger of being blamed for the failure of the multilateral trading system. Governments: listen to your people! Abandon Doha! Confront the Crises!